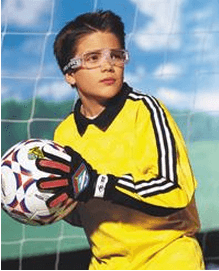 The importance of sports safety glasses for eye protection when playing sports cannot be overstated. According to the National Eye Institute, sports account for 40% of all eye injuries in kids 11-14 and is the leading cause of unilateral vision loss in all age groups. With 60% of kids between the ages of 5-18 playing organized sports, the American Optometric Association, American Academy of Ophthalmology, and the American Academy of Pediatrics have all encouraged greater use of sporting eyewear protection. So what constitutes protective eyewear? That job falls primarily into the hands of the American National Standards Institute (ANSI). ANSI is a private, non-profit that develops guidelines for a wide range of products, including eyeglasses. These guidelines are called “standards”. Standards are voluntary for a given industry to uphold. The Standard for protective eyewear is Z87.1-2010, implemented in 2010. Z87.1-2010 is significant for a couple reasons. First, it was the first update to the ANSI safety eyewear standard since 2003. Second, it turned the 2003 standard on its head. The 2003 standard was organized by type of eye protector, for example, spectacles, goggles, etc. The 2010 standard is organized by the type of hazard, for example impact, splash, etc. For sport safety, the impact standards are that which eye care professionals are primarily concerned. 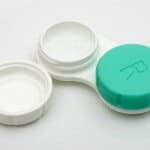 Contrary to popular belief, minimum lens thickness is no longer part of the standard, as long as the lens can pass the infamous drop ball test. The 2010 standard also includes a new way to categorize impact resistance. Previously, lenses were rated as either “basic” or “high impact” protection. In the 2010 standard, these have been changed to “non-impact” and “impact”. Those rated as “impact” pass a higher velocity and heaver drop ball test. How can you tell if a lens is “impact” rated? “Impact” rated lenses are marked “Z87+”. “Non-impact” grade lenses are marked simply “Z87” without the +. Compliance with standards is based on a manufacturer’s own in-house quality control procedures. Independent certification is not required. The American Society for Testing and Materials (ASTM) created its own standard for certifying sport eyewear and is becoming the new standard in the sport eyewear industry. Originally created specifically for racquet sports, its F803 standard covers racquetball, handball, tennis, lacrosse, field hockey, baseball, and basketball. In this system, a 3.0mm center lens thickness is required. Whereas ANSI Z87.1 was created for occupational safety eyewear and is applied to sport eyewear, the ASTM F803 was created specifically for sport eyewear and has stricter eligibility requirements. The American Academy of Ophthalmology recently went as far as to call ANSI Z87.1 “not satisfactory” for eye-injury risk sports, recommending the ASTM standard instead. When examining children active in sports, remember the three “musts”. MUST prescribe. Write ANSI or ASTM on the prescription and educate why. MUST warn. Google “duty to warn” to find forms you can have a parent sign if they refuse ANSI or ASTM safety eyewear. It will emphasize the importance and save you from legal troubles. As a member of OptiQuick, you will have access to a “Duty to Warn” form that you can customize with your own company logo. MUST inspect. Insure the safety glasses you order are imprinted with the proper insignia designating it as impact rated.